In 2018 CMTA partnered with CompanyWeek to profile Manufacturing Champions -- part of a growing archive of California profiles of manufacturing companies. The stories of modern manufacturing and the rewarding and exciting career paths within the sector must be told, and they should be told through the lens of California's very best manufacturers and their workers. We'd like to feature your company and your workers in 2019, so CMTA and CompanyWeek will pick up 100 percent of the costs for all CMTA members. Don’t miss this opportunity to showoff your operations, employees and products. CMTA members such as Jelly Belly and BWC have previously been profiled. If you are interested, the steps are simple. We'll assign a writer to interview you, by phone, and send a photographer to your location. If you are a CMTA member and would like to be profiled, please contact me at gdicaro@cmta.net or 916-498-3347. This week CompanyWeek and CMTA bring you HDA, a Lake Forest based development firm that serves a broad range of medical, aerospace, and industrial clients, providing both engineering and contract manufacturing services. The privately owned company has operated since 1983, recently becoming well known for their products that help clients pass regulatory compliance or solve highly technical and difficult challenges. HDA also sources most of its supply chain - mostly circuit boards - from other California companies. With just 16 highly technically skilled employees and almost no automation, HDA is a good example of today's small manufacturing firms that are highly specialized to provide extremely customized products, all the while providing high wage jobs up and down the supply chain. Most of HDA's supply sources are domestic and CEO Hunt Dabney says he likes to keep it that way as much as possible. "We work with local California communities to populate circuit boards, and we use local laboratories quite often for testing," says Dabney. "Some things, such as electronic distributors, however, get sourced overseas because they are not readily available here in the United States. We try to find the parts that we need, and at times, we have to source them overseas." Challenges: Market penetration. "We aren't a large firm, so there is a limit to the number of programs we can run," says GM Jon Schmidt. "Firms like us go in and out of being in a marketing phase. I've spoken with friends who own similar firms who agree that at times, you get too busy to take anything else on. You start finishing programs, then you are back to marketing again. We are working to improve in this area." Opportunities: "In terms of startup companies, the medical industry peaked last year," says Dabney. "It's interesting to support people as their products are going into clinical trials. We have companies that we work with where we manufactured a product for them 10 years ago, then they'll get acquired and the new owner will not retain the information needed to manufacture the same product. Then, those companies will ask us to build the product back up. We have good record retention and can always help in this area." We're introducing a new feature to the Champions blog. We have partnered with CompanyWeek (CW) California to share information on the state's premier small to mid size manufacturers. CW's featured companies are part of CMTA's Champions recognition program, intended to boost the image of California manufacturing and convince policymakers that manufacturing is the single best way to grow California’s economy and create high quality jobs. 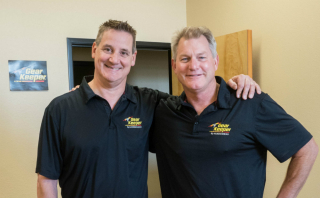 This week CW California brings you Hammerhead Industries, a Ventura-based company created by two engineers turned entrepreneurs from General Motors. They founded the company in 1995, which focuses on retractable gear products, and have grown to 23 employees. Their determination and grit show how a small manufacturer can meet the custom demands of 21st Century markets and compete in a global economy. They have tremendous opportunities before them, including in the industrial safety industry, but their business environment challlenges remind us that California policies must always consider the impacts on our state's prized manufacturers' abillity to invest and grow. Producing a high quality product in the US, two entrepreneurs are meeting the challenges of competing in a global economy and competition from overseas manufacturing. Hammerhead Industries and Gear Keeper products were born from two General Motors engineers looking for a better way to attach and protect their equipment while SCUBA diving. Co-founders John Salentine and Ken Collin tried a basic key retractor to hold their flashlights and gear, but it needed substantially more engineering to make it work properly and to last in salt water and sand.